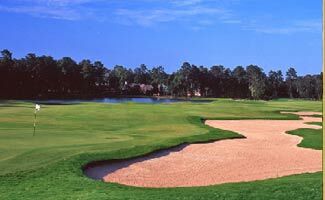 South East Texas Golfing Vacation - 90 Holes In 4 Days! could the mind and body and clubs manage 5 courses (90 holes) in 4 days? who would be the brunt of my frustration from four days of hooks, slices, and duffs? how many clubs and balls would I lose? would one, or two bottles of Advil be needed? how strong would I need to make the margaritas to help me recover from so many rounds? So with some fear and trepidation as well as promises to my wife and friends that I wouldn't take it out on them, we loaded the car with clubs, 15 sleeves of balls for me (that's one ball for every other hole, surely I could manage that! ), a couple cases of beer, sun tan lotion, snacks, and games. And we for rolling south on I-45 for our first round at Texas National Golf Course in Willis, Texas. Turns out that Texas National was a real test of my ability to try and keep the ball in the fairway, remain calm, practice my course management, and sharpen my golf ball finding skills. Wow, Texas National is one tight and challenging course. It was carved out of the tall east Texas pines and after the third hole, we don't see anything but trees, sand traps, water hazards, birds, squirrels, and the cart lady - what a fun and fantastic way to start the trip. We also didn't see or find the 2 sleeves of balls that found their way into the water or forest - 2 down, 13 sleeves to go! Texas National was home to the Texas Golf Hall of Fame from 1976 to 1987 and in it's heyday the course was host to some major tournaments and was played by some of the best golfers on the tour. Over the years, not only has Texas National chewed up a number of golfers hopes for a good score it has also chewed up and spit out several owners and management teams. Unfortunately, the course also got chewed up by several wild varmints, two hurricanes, and was neglected over the last few years. The conditions deteriorated as did the service. The good news is that new owners and management are now in place and based on our meeting with them they seem very committed to returning Texas National to it's former state as one of the best in the Lone Star State. They have already made a number of improvements and are focused on service and ensuring that everyone leaves Texas National with a memorable experience. Texas National is in pretty good condition as it is and remains very playable with some fun and memorable holes, some extremely tight fairways and approaches, elevation changes, lots of rolling fairways, dog legs, and more. It's a short (6806 yards) but challenging course with a slope of 127 and a rating of 71.4. Regardless, I finished the round with all my clubs, my golfing buddies were still talking to me, and I had a respectable round - not a bad way to start the trip. Here is a link to our review of Texas National Golf Club. From here we headed a little farther south on I-45 then 24 miles west past Lake Conroe and to the small town of Dobbin (population 220 and one funky little bar and grill) - a very scenic drive. When we hung a left, we started to think our GPS was taking a nap - this is beautiful farmland in the middle of nowhere! Who would build a golf course out here and what would it be like? After another turn off the back roads onto a small private road to , we passed a couple beautiful golf holes and ended up at the Blaketree pro shop and our cottage for the evening. The head pro greeted us with two golf carts and the keys to Magnolia Cottage. We invited him in for a beer and enjoyed some of his stories and the history of Magnolia Cottage. Calling this a cottage is a major understatement - it is a very well appointed four bedroom, four bath, house with a comfortable living room, a dining room, separate game room, and a large deck overlooking the first tee box and pro shop. I could live here for the rest of my golfing life! 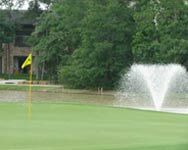 To learn more, check out our Blaketree Golf Course Stay & Play Reveiws. Blaketree was purchased and Tiger Woods has build a new course call Blackjack National. After a Mexican fix and a couple margaritas in the nearby town of Magnolia it was back to our cottage for some dominos well into the evening - finally, I found a game where I could score well - I can only hope that it will continue into our round at Blaketree. The next morning was fantastic - a quiet and peaceful breakfast on the deck overlooking the first hole and then stepping out the front door to jump in our cart for the 30 second ride to the first tee box. 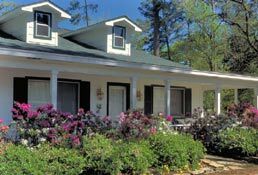 The Magnolia Cottage set the stage for the Blaketree National golf course - a fantastic layout and like the Cottage, one of those courses you can't wait to get back and play and stay again. Blaketree has a story similar to Texas National as it is also in recovery mode and we're pleased to report it is doing very well on it's way to pristine condition. We found it to be in pretty good condition and a joy to play. 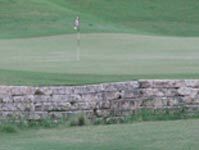 In fact, in 2008, the Dallas Morning News rated it #2 in the "medium price range golf courses" category and #25 in the "Top 50 public courses in the state of Texas." This is a true country course where it's just you, some fellow golfers, and nature - lots of trees, a couple lakes and ponds, and plenty of wildlife. The peace and quite of the country was magnificent. Blaketree will present you with some roller coaster fairways, elevated tee boxes and greens, blind shots and dog legs, and a couple risk reward opportunities. Course management and club selection coupled with the ability to hit the fairway are keys to scoring well here. There are a number of very fun and memorable holes. 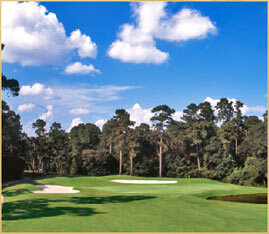 Take #4 for example which has an elevated tee box that overlooks the entire hole and most of the state of Texas. It's a dog leg left around a pretty large lake with a narrow fairway to a small green protected by the lake and a bunker. This is one of those holes where you can go for it and try to cut off most of the dog by flying the lake or take the conservative approach down the right side leaving you a very tough and long approach shot. I tried to fly the lake and missed, tried it again and missed, and finally took the conservative approach and smacked it into the woods - another sleeve gone and all off one hole's tee box and I'm only on the fourth hole - not a good sign for the Callaways! You can find out more about the course by reading our review of Blaketree National Golf Course. After our round at Blaketree, I popped some more Advil, reloaded a couple sleeves of balls (I lost two on Blaketree), checked to see if I'd lost any clubs, smeared suntan lotion all over my sore sun burned body, and packed the clubs and cooler in the car for a short drive to play High Meadow Ranch Golf Course in Magnolia. At the end of the day after a long evening (or short sleeping session) and 18 holes, playing another 18 would be the true test - would I glow in the dark from all the sun, could I walk without limping or using a club as a cane, and would the rest of our group still talk to me! It was a short but scenic drive to High Meadow Ranch and when we turned into the High Meadow Ranch community, we were in awe of the absolutely stunning huge and beautiful homes on acre lots that we passed on the way to the pro shop. Would the course live up to this magnificent community of large perfect manicured and landscaped homes? Yep it did, and then some. High Meadow Ranch Golf Club is fantastic - a very good layout that is somewhat challenging and is in near perfect condition. After playing the tight and narrow dense tree lined fairways of both Texas National and Blaketree, most of the fairways at High Meadows Ranch seemed as wide open as the Pacific Ocean! The drivers immediately came out - it was good to try and let-um-rip but it was payback time for the driver, since he had been kept in the bag for most of the previous 36 holes. I was quickly down another sleeve. When we arrived back at the clubhouse, as I was totaling the scores from the round and adding up the side bets from bingo-bango-bongo and skins, I was pleasantly surprised by my score and immediately started bragging about what a great score I had on the front nine! Only to hear all three of my worthy opponents shout in unison, "that was only the first six you idiot, not nine holes!" Upon closer perusal of the scorecard, I noticed that High Meadow Ranch's course and scorecard is broken into three six hole rounds! Each of the nines (oops, sixes and the score card calls them loops) is a little different and has it's own unique character. The first six is called, the Forest Loop because it plays through some majestic oaks and pines as it meanders its way through this exclusive neighborhood of beautiful homes and across a number of natural ravines. 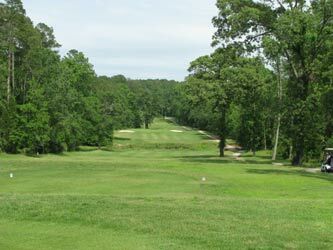 The Pine Barrens Loop plays through property that was once mined for iron ore and this six features large forgiving fairways, native grass waste areas, and some fun holes. #7 is a fun one at 414 yards with a sharp dog leg left and hidden bunker and a large grass waste area at the precise place where my ball needed to land to make the turn. Down another one. ast six, the Signature Loop, is the best of all with some fantastic holes with elevation changes, deep woods, native waste areas, including one of the best finishing holes in the state. #18, appropriately named "The Wall" because of an imposing stone wall fronting the green, requires you to carry two creeks, one of which protects the front of a downhill green. Great hole to end a fantastic round which ate another sleeve of balls. Read the review of High Meadow Ranch Golf Course. We downed a sandwich and another spicy Bloody Mary and took a short scenic drive back to Magnolia to play Canongate at Lake Windcrest. Rested and ready to go, I teed off and watched my new Callaway hook right into the creek that lines the first hole. Not a good sign of things to come. In fact, my balls seemed to want to swim instead of roll on the generous fairways and Lake Windcrest has water on 9 holes which proceed to consume another sleeve and a half! 18 balls left and only 18 holes to go - I can do it! Lake Windcrest is an outstanding track that is well maintained and manicured, in excellent condition with lush forgiving fairways with plenty of contour and mounding, and fast and consistent greens. You'll also encounter some huge beautiful homes set back off the fairway - in fact, I donated a couple new Callaways to these Lake Windcrest millionaires. The front nine has a links feel and seems like it is much more open, whereas the back nine is a little tighter and has more interesting landscaping and terrain. If all the fairways are so generous, how did I loose so many balls! What makes this course hard are the numerous treacherous steep faced bunkers with hard sand, uneven lies in the fairway because of the mounds and contouring, and the fast greens. The greens were in excellent conditions with both slope and undulation and if you missed a downhill putt, you'll most likely go flying past the hole. Been there, done that! There are a number of fun and interesting holes, number 2 is a good example. Off the box you have a wide open landing zone on this 520 yard par 5 #3 handicap hole. But the second shot is the challenging one - if you had a long straight drive, you can risk trying to fly a large natural waste area and hope to avoid the two traps protecting the front and the four protecting the back of the green. The rest of us short hitters and any conservative player will try to hit the narrow fairway which makes an "S" turn on its way to the green and then take an easy chip shot for on in three! 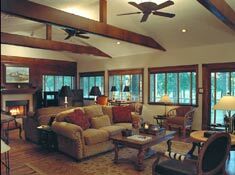 Read our review of Lake Windcrest to learn more. 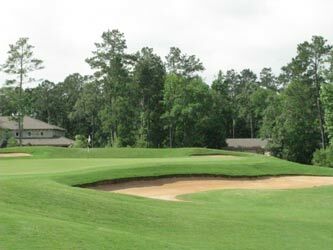 Lake Windcrest is part of the Canongate Golf Clubs which include Panther Trail and The Oaks in the Woodlands and Canongate At Magnolia Creek in Magnolia - all are fantastic courses. And our next stop was The Woodlands Resort with golf at Panther Trail. From Lake Windcrest it was a short drive back to I-45 and south to the Woodlands to check into the . After cooling off in the great pool, a long soaking in the hot tub, a few cold beers, and more Advil, I was refreshed and ready to party. We met up with a good friend who has a jewelry store in The Woodlands and headed out for a good dinner and some bar hopping. The Woodlands (less than 5 minutes from the Resort) is loaded with upscale shopping (voted by Southern Living as one of "the best shopping destinations in the U.S."), bike trails, a riverwalk with a water taxi, great restaurants, and fun nightlife. 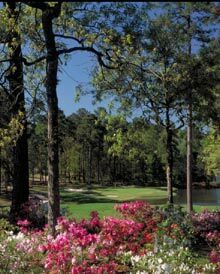 Here is a link to The Woodlands Resort Convention and Visitors Bureau to learn more about what to see and do. 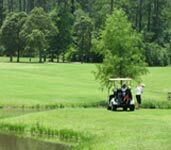 The Woodlands Resort & Conference Center is perfect for a golf outing - they offer a variety of accommodations, two good restaurants, a spa, fitness center, a bar and lounge with pool and shuffleboard, a couple swimming pools, tennis courts, golf practice facility, and more. We enjoyed a great breakfast buffet sitting outside on the deck overlooking the lake, fountain, and 18th green - what a great way to start a day. 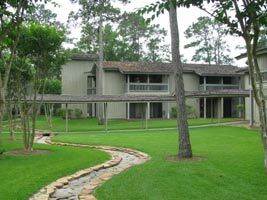 In addition to all that, as a guest at the Resort you can play two fantastic Canongate courses - Canongate Oaks and Panther Trail both of which are next door to the pool and lobby of the Resort. 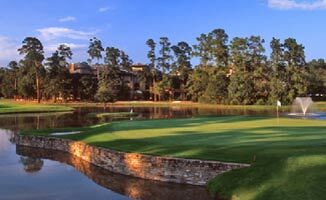 To lean more, check out our review of the Woodlands Resort and Conference Center Stay & Play. The Oaks Course is a private club available for resort play and a good traditional course in excellent condition that is well worth playing when you stay at the Woodlands Resort - here is a link to the review of the Oaks Golf Course which we had played on a previous golfing excursion to The Woodlands. If you can't play both, than our preference is Panther Trails. 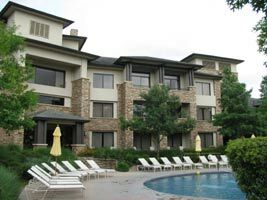 At the Woodlands Resort, we stayed in standard king room at the Fairway Pines complex which has a perfect pool area with a dual water slide, large pool with a basketball hoop and a volleyball net, a hot tub, and a bar and grill. Our room had all the standard amenities and overlooked the first hole of Panther Trail. That night I had nightmares about driving my first golf ball through our hotel room window and bonging my wife in the forehead, teeing up again and watching my second shot dribble into the water in front of the ladies tee box, and teeing up once again when the course starter ask me to head back to the driving range. So I got up tired the next morning but excited about playing Panther Trail. Or maybe I was tired from a late evening eating and hanging out in The Woodlands. 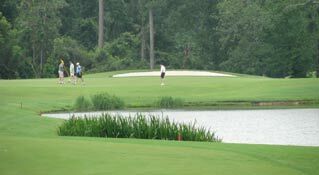 Panther Trail is the tougher of the three Canongate courses we have played and you need your "A" game to score well here. I have never found my "A" and have no clue how to find it or where it's hiding, probably with my other sleeve of balls in the trees, lakes, waste areas, and streams on the other courses we played on this trip. I am happy to note that contrary to my dream the night before, I didn't dribble my first shot into the lake - instead I took my time, focused, kept my head down, took a slow back swing, and smashed a new Callaway a mile deep into the trees lining the fairway. Rather than risk another ball (I only had 18 left with 18 holes to go) and the starter asking me to head back to the range, I immediately jumped in the cart and drove to where my ball had gone ricocheting off the trees. But after the Advil kicked in and I kicked the jitters, I ended the day with only two lost balls and a respectable 85 - I love this course! 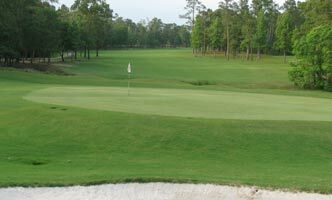 The greens are great, the fairways are lush, the rough is cut short and playable, and Panther Trail is very well maintained and manicured. The greens were about average speed and very true. On the way to the greens you'll encounter water on 11 holes, a few beautiful homes, velvet smooth fairways, some sharp dog legs, and some easy to par very fun holes. #9 is an 571 yard par 5 (#3 handicap) sharp dog leg right about 150 yards out. It offers some risk reward opportunities (can you carry the lake and not over or under shoot the protected green?) and requires some thinking before you select what really needs to be the perfect club based on the route you take to the green. Play this course at twilight and it is a fantastic value. Great course and we can't wait to get back and play it again. Here is a link to our review of Panther Trail. What a fun and memorable trip and best of all I went home remaining friends with our golfing buddies and my wife, plus after 90 holes in 4 days I still had a few Callaways left! But all the Advil, half of the sun tan lotion (that stuff doesn't work on me - I was red as a lobster), and all of the Miller Lite was gone. On the way home, we started thinking of where we could go for our next golfing excursion.